Few of biological life’s processes are as magical as the transformation that some insects undergo called metamorphosis. A great way for kids or adults to experience this magic for themselves is to capture a caterpillar, feed and take care of it, and watch it transform into a butterfly -- or a moth. The first step in your experiment is fairly straightforward: Go out into your yard, your garden, or the nearest park and find a caterpillar. Be careful -- caterpillars that look hairy are often covered in urticating hairs that can be cause itching and irritation if they get on you. Place your caterpillar in a jar, cover the jar with a breathable material like cheesecloth, and secure the cheesecloth with a rubber band. If you find your caterpillar on a plant, place a few leaves and branches from that plant in the jar. Often, a caterpillar is on a particular plant because that plant is the only food it eats. Always include a variety of other plant types as well; not all caterpillars eat the same thing. When you get your new friend home, get on your computer or talk to a local expert to try to find out exactly what species of caterpillar you have. Yours might become a butterfly or a moth. For information on habitats and food, check out the University of Arizona Center for Insect Science's guide. To best care for this pet, you need to know all you can about the species you're fostering. Once you have discovered what plants your caterpillar friend should be eating, put the appropriate leaves and fibrous twigs and sticks in a bag of water and store them in your fridge. This will ensure that they stay fresh and hydrated. 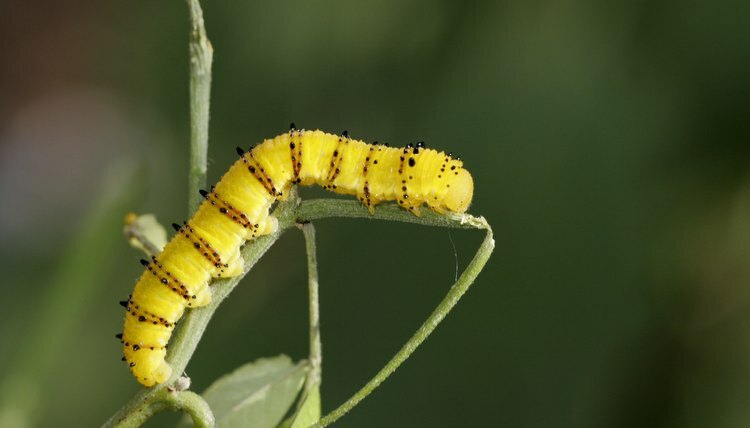 Caterpillars don’t drink; they absorb water from the leaves they eat, so the plants you feed them must remain moist. As your caterpillar grows, the creature will go through a series of molts in which the caterpillar sheds layers of skin in order to gain size. When the caterpillar is ready to shed its last skin, it will look for a safe place to form its cocoon or chrysalis. This is the pupa stage. Some species may prefer to hang from a branch, while others hide under leaves on the ground -- another reason why you should know exactly what kind of caterpillar you have. Many species will wrap cocoons around themselves and go dormant for a period of a few weeks to a few months. When the pupa has finished maturing, it will break free of its cocoon. The butterfly or moth has reached maturity. After witnessing the beauty of the transformation, you and your child should release the winged creature into the wild, preferably in the area where you captured it. Your pet needs to fly, feed and mate, and it can’t do that very well in a jar. Instead of keeping the adult butterfly or moth, go out looking for a new type of caterpillar and repeat the process to see the magic happen all over again.